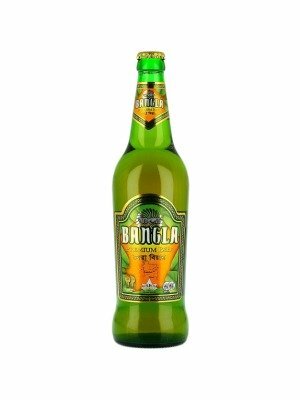 Bangla Beer is a popular Lager available from DrinkSupermarket.com in 660ml to buy online. Visit DrinkSupermarket.com for the best price for 660ml of Bangla Beer or compare prices on our other Lager products. From the temples of Dinajpur to the tea gardens of Sylhet, from the rainforest of Shundorban to the white sands of Cox Bazar. Bangladesh offers a myriad of exotic sights, cultures and culinary delights - the essence of which you'll discover in Bangla premium beer. A stronger beer ,perfectly complements stronger flavour. It's Name...... Inspired by one of the richest languages in the world as immortalisation poetry and song by the Noble Prize winner Robindra Nath Tagore It's Colour...... It has a deep gold colour ,reminiscent of the golden hue of the sun setting over the Bay of Bengal It's Taste...... Bangla beer is a specially created brew, designed to complement Bangladeshi and Indian Cuisine. It is stronger to provide a robust taste platform to soften the most warming of spices but remain delicate enough to augment the sophisticated texture of curry dishes. It has a rich full flavoured smooth taste. Where to buy Bangla Beer ? Bangla Beer Supermarkets & Stockists. You can buy Bangla Beer online in most retailers and find it in the Lager aisle in supermarkets but we found the best deals online for Bangla Beer in DrinkSupermarket.com, TheDrinkShop, and others. Compare the current price of Bangla Beer in 660ml size in the table of offers below. Simply click on the button to order Bangla Beer online now.